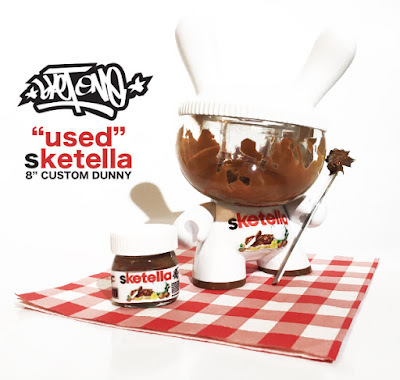 Sket One’s awesome custom Sketella 8” Dunny is back in a brand new colorway! Whether you missed the first run or have one proudly on your toy shelf, Sket is bring us a new Used Edition Sketella Dunny. The Blot loves the use of a translucent resin Dunny head to make the figure look like it’s a half empty bottle of Nutella with remnants of the deliciously hazelnut and chocolate spread. The Sketella Used Edition 8” Dunny comes with a 2.25oz custom mini bottle of Nutella, an 8”x8” picnic plaid placemat, and a 5”x.5” custom spreading knife with resin dollop of Nutella. Each figure comes signed and will go up for pre-sale at 12pm EST this Friday, June 16th, at the Sket One online store for $485. The pre-order period will only run for 24 hours (ending at 12pm on Saturday, June 17th) so don’t sleep on this awesome new timed release colorway!